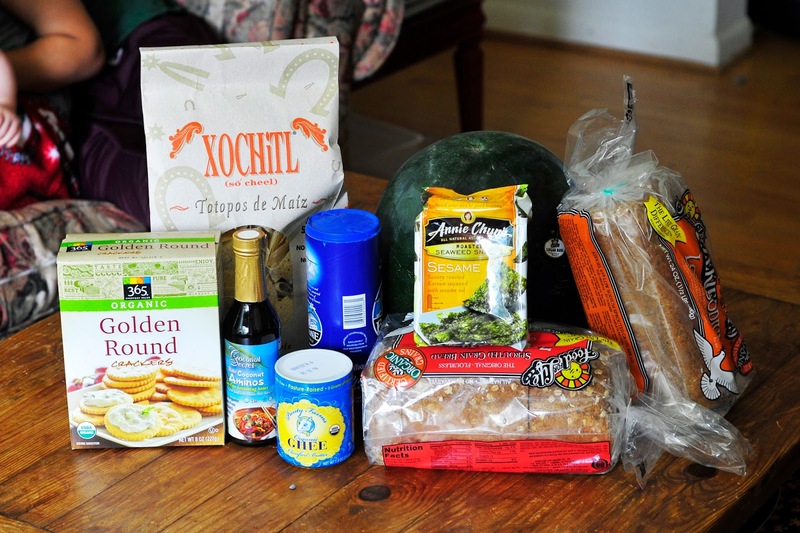 Simply Gourmet: What's in my Shopping Cart? What you see: 1 watermelon, 1 pineapple, 2 grapefruit, 8 apples, a bag of grapes and 6 peaches, 2 kiwi. 1 head of cauliflower, 1 bunch of parsley, 1 box of spinach leaves, 1 head of iceburg lettuce, 1 box of mushrooms, 3 zucchinis, bunch of radishes, 3 rutabagas, 3 sweet potatoes, 1 bunch of kale 5 pound bag of carrots, 3 yellow beets, 5 heads of romaine lettuce, 6 lemons, 1 acorn squash, 1 bunch of asparagus, 2 garlic bulbs, ginger root and 1 celery. I thought it would be fun to share with you our families grocery shopping excursion for one day. 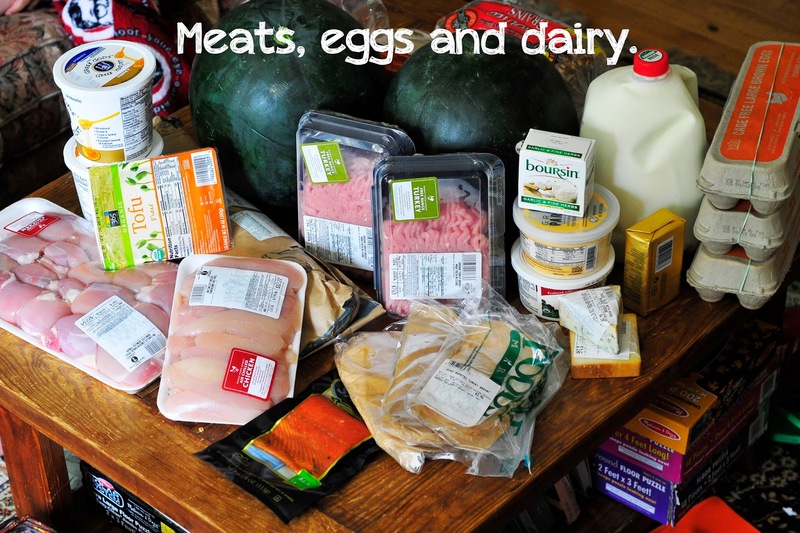 If you read my blog then you know that I am a huge fan of organic and grass fed foods. I shop every 10 days for our families meals. This doesn't mean I am not in the store more than that-- because I am. It seems just when I think I have gotten everything on the list, I get home and discover I forgot something and a new list is started. Keep in mind that this is what NORMALLY happens with our budget and meal planning. Life events pop up and plans change. I have learned to be flexible and try to be prepared for when life throws us a curve ball. Let's talk budget first. Everyone has their own idea of what their food budget is. I am not going to judge or tell you what that budget should be. I can only tell you what my budget is. I have a family of 6 and this past summer we had one extra teenager. So all summer I have been cooking for 7 people: 3 adults, 2 teenagers, 1 kid, and one baby. Cory and I both work from home and we rarely eat out--even when we go on day trips, we pack a lunch or snacks. This means that I plan 21 meals over the course of 10 days ( 7 people X 3 meals a day= 21 meals) plus snacks. To be honest, my kids don't snack much. I think this is because we don't eat a lot of processed food--they eat real food. How much do I budget? My budget is $300.00 every 10 days and $1200.00 a month for food. The extra money leaves me enough for last minute items, specialty items for unplanned dishes, sale items that I can buy in bulk and unaccounted extras in the kitchen. What does it run me a meal? Just under $15.00 per meal for 7 people over 10 days. Fast Food: $25.00 That is if we can each eat for under $5.00. Mid-Range Restaurant: $70.00 This is a tight number and is much more usually + tip. Sushi: $150.00 We do this once a month. We love it! I consider sushi healthy and I never get sick when I go. This is a treat because I get a day off from the kitchen. I use my own gluten free soy sauce. They know me very well at this restaurant and this helps too. SOOOOO--We eat in, we buy organic food, shop locally when possible and love that our meals cost about $15.00. What you see: Enough chicken thighs for 3 meals, 1 package of chicken breast pieces, 1 whole rock fish, tofu, 2 pounds of ground turkey for two meals, smoked salmon for snacks, 1.5 pounds of turkey meat for kids lunches, 2 containers of Organic Greek yogurt for smoothies and snacks, cottage cheese for snacks, cheese for snacks, 3 cartons of organic brown eggs, 1 pound of grass-fed butter and 1 gallon of organic milk. The two watermelons are to help me hold things up but we did buy two for this week. 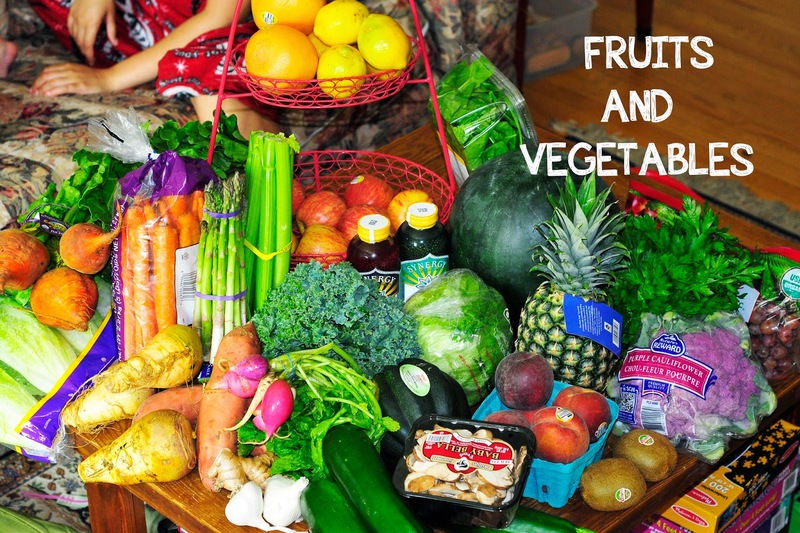 Fruits/Vegetables: I usually buy, during the summer months, our vegetables from Farmer Markets and local produce stands in the area. Not all of what I need is available and so I do have to purchase things from a grocery store. We also buy frozen fruit for smoothies as needed. We did not buy them on this trip. Meat, dairy and eggs: Our meat comes from two sources: Whole Foods or through our local farms. I have not reordered our local meat (next month) so I bought what we need from Whole Foods for this week. My family does not drink a lot of milk and that 1 gallon will last us the full 10 days. We use greek style yogurt and a small selection of cheese. I have switched our family to eating more chicken, turkey and fish. We eat very little red meat and pork. Other: This category is for the boxed or packaged dry items. You can see that this is the smallest bundle of ingredients. I don't eat bread or most carbs but my kids still eat sandwiches for lunches. They like chips too. I buy a small selection of items from Amazon Prime each month because I can get bulk pricing: oils, pasta, chips, canned tomatoes, coconut milk, gluten free pretzels, and all of my gluten free flours/starches. This is where that extra money comes in each month that I talked about up above. Not pictured and not purchased on this trip. This is a list of a few things that I buy when I run out: extra virgin olive oil, peanut butter, nuts, spices, coffee, tea, honey and maple syrup. I find that because I buy this stuff in bulk it will last my family a few months. You might be surprised to see that we don't buy a lot of everyday items for making meals . Such as canned cream soups, broths, condiments and pre-made sauces. I make most of these items from scratch. We don't eat many sugary sweets. I try to make a healthy treat about every 4 days. We don't eat meat everyday. I make meat a part of our diet every other day (dinner meals) The kids eat meat daily with lunches and leftovers. We eat a lot of vegetables in our smoothies, salads and then most of them are made into side dishes. What do we snack on? I know it would appear that we don't have any fun foods in our shopping cart. This is because I make most of these from scratch. Our kids enjoy popcorn, nuts, cheese and salami platters with fruit, fresh fruit salads, yogurt with nuts and berries, frozen yogurt (greek yogurt and frozen berries blended together), chips and the occasional cookie. What do we eat? Here is just a small sampling of some of the things we eat each day. Breakfast--through the week we have smoothies. Isabella and Finnley usually have an egg, toast or oatmeal. On the weekends I will make gluten free pancakes, biscuits, waffles, crepes or omelettes. Lunch--our lunches are sandwiches (kids and Cory), salads, sauteed vegetables and leftovers from the night before. I make large dinners so that we have enough for the next day (at least 2 or 3 servings). Dinners--what you see on my blog is what we eat for dinners and leftovers. In preparing and planning our meals I try to stick with Paleo dishes first with the occasional gluten free item thrown into the weekly lineup. I make a list of dishes I want to make for the 10 days and try to stick to the list. I ask my kids each time before I go shopping if there is anything they want me to make (favorite dishes) and we collaborate together to come up with our menu for dinners. Our kids love to shop with us. I like to have their input when planning. I believe it is a great way for them to learn about menu planning, healthy choices, budgets, how to select fresh food and to learn about local farmers. It gets them into the markets so they can see prices and understand how expensive food is and to not waste it by taking too much for their plates. I hope you found this helpful. Please leave me a comment with any questions you might have or what you would like me to share with you next time about our shopping excursion. I would like to make this a feature on the blog if there is any interest.